Wear a hat, for crying out loud. And a scarf, gloves and layers. Lots and lots of layers, if you absolutely have to go outside because it's going to be bitterly, dangerously cold. A wind chill warning is in effect through 6 p.m. with wind chills as low as minus 25 possible. That's on top of the lake-effect snow and the winds gusting over 30 to 35 mph in the forecast for the day for the Buffalo metro area and the Southtowns. "This is a potentially dangerous situation to be outdoors. If you must be outside, be sure to cover all exposed skin. Frostbite can occur in 15 minutes or less with apparent temperatures of 25 below zero or colder," the National Weather Service warned Thursday morning. So far in the forecast, a low of minus 22 wind chill was forecast for this morning in Buffalo with a minus 23 wind chill in Hamburg. Last night, the Buffalo airport logged a low of minus 30 just before 10 p.m. in the midst of the blizzard. "It's 3 degrees and we've got a wind chill factor right now of minus 15," said Aaron Reynolds, a meteorologist with the National Weather Service office in Buffalo. "With the lake-effect snow, the winds will pick up and you'll get up into the warning criteria." 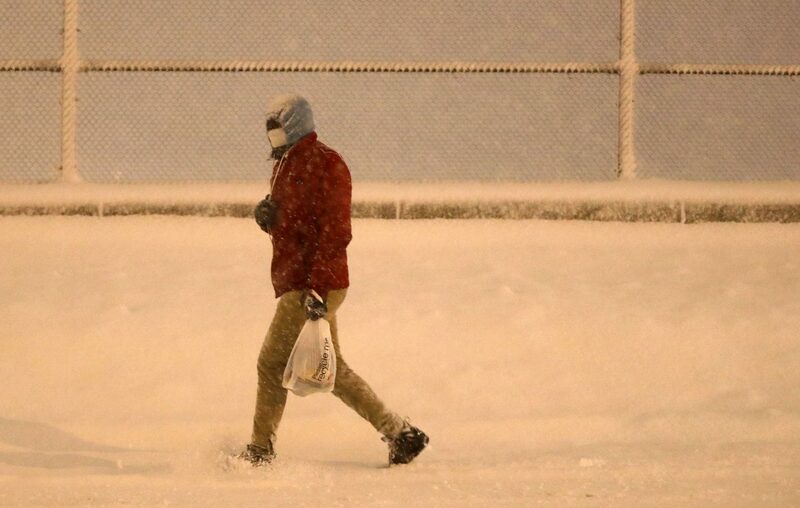 Erie County Health Commissioner Dr. Gale Burstein urged people to stay inside. For people with cardiovascular health issues, shoveling under normal circumstances can be dangerous. Trying to shovel in the severe cold would be put them at even more risk, she said. "There's no reason to be heroes," she said. "Stay inside during extreme cold temperatures..... It's only one more day and we can get through it." Frostbite and hypothermia are both possible during conditions like Buffalo is experiencing. Hypothermia is caused by the cooling of the body caused by the failure of the body’s warming system. The goals of first aid are to restore normal body temperature and to care for any conditions while waiting for EMS personnel. Call 911 or the local emergency number immediately. Warm the person slowly by wrapping in blankets or by putting dry clothing on the person. Hot water bottles and chemical hot packs may be used when first wrapped in a towel or blanket before applying. Do not warm the person too quickly, such as by immersing him or her in warm water. Rapid warming may cause dangerous heart arrhythmias. Warm the core first (trunk, abdomen), not the extremities (hands, feet). This is important to mention because most people will try to warm hands and feet first and that can cause shock.